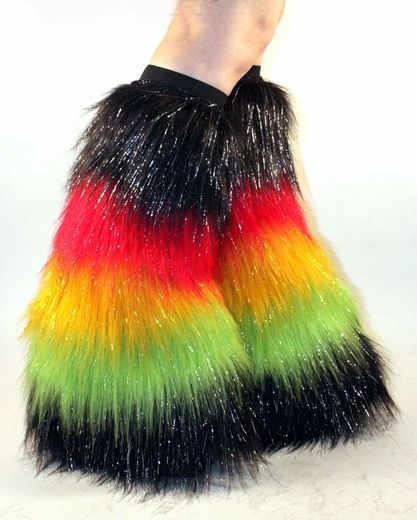 These Fluffies are super long and flared, they have a stretchy elastic band sewn at the top (can be worn shown out or hidden - tucked in) To keep them from slipping down while you�re dancing, walking, running or plainly partying the night out at the club. They're one size, about 19 inches long (Stretchy elastic will Fit most calfs, let me know if you think you might need custom size or length). Perfect for Burning Man and other Rave festivals. Great for clubbing, clubwear, cyber goth and Industrial wear, rave, cosplay, punk, anime, Gothic clubs, exotic and go go dancer.